There is something genuinely comforting about warm tuna covered by melted cheese. This is the famous “tuna melt,” which my father ate every day of his elementary school years, during the Fifties, when kids walked home for lunch. His was a sandwich of tuna, covered with melted cheese, slices of egg, and a pickle. The sliced egg and pickle were my grandmother’s idea, but the tuna melt has endured as the fish-version of cheeseburger. But that was elementary school. Eating a massive tuna melt would be a difficult endeavor for a toddler, not to mention messy. The solution: Muffinize. Turn the classic sandwich into a muffin. Now you have a hand-held package that’s packed with protein, moist and almost as fluffy as Wonder bread. 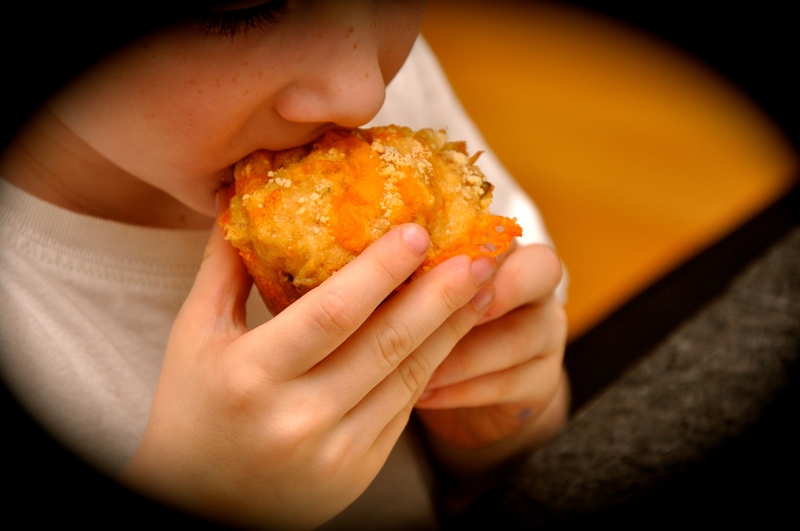 This cheesy muffin is oozing with cheese in an inner pocket and crisped to perfection on the buttery-tasting outside. The dill, lemon juice, and Parmesan add to even more zest to the flavors and charm of the recipe. The muffin tops give a nice bite to this recipe that does not include butter, just tastes like it. The scent, emanating from the oven, brings back the days of childhood when school lunches meant grilled cheese and tuna fish sandwiches. These are wonderful at room temperature, and even cold. 1. Preheat oven to 350 degrees. Coat a 12-cup muffin pan with cooking spray. 2. In a mixing bowl, sift flour, baking powder and salt. Stir in chives, pepper, and 1 cup cheese. 3. In a separate bowl, combine lemon juice, oil, egg, milk, and tuna. 4. Add wet ingredients to flour mixture and stir until just combined. 5. Spoon mixture into prepared muffin cups to ½ full. 6. Sprinkle 1/2 cup cheese on top of each cup and spoon the remaining batter on top of each. 7. 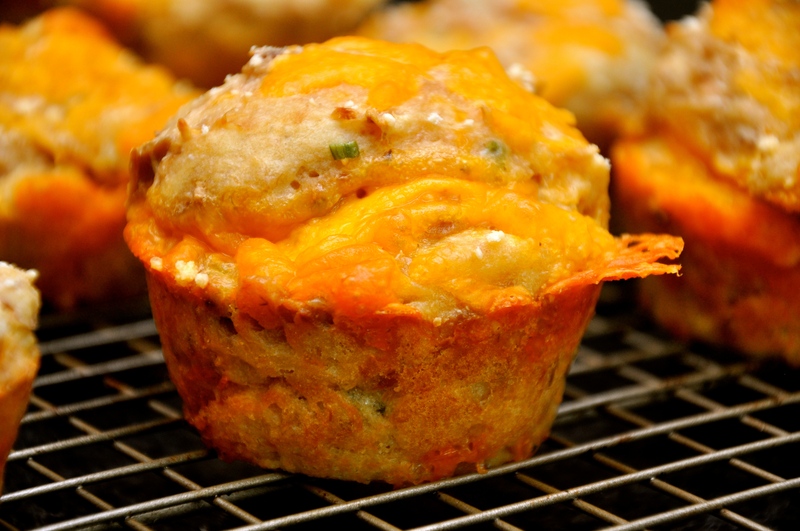 Sprinkle Topping on each muffin cup (first shredded cheese, then Parmesan). 9. Remove from muffin pan immediately and place on a wire rack to cool. 10. Serve piping hot, room temperature, or cold.